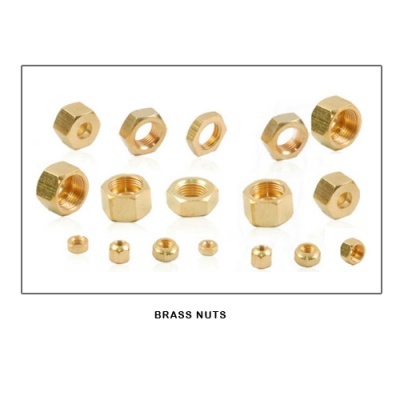 We offer a host of Brass nuts with various types and for various applications from our factory in India. Our cold forged Brass Nuts and Machined Brass nuts are used by customers in 32 countries worldwide. Packing of BRASS NUTS in 100/500/1000 pcs bags. Threading : Various types and sizes of Threads like BSW B.S.F., BSB, BSP BSPT per British Standard Whitworth Form and N.C. & U.N.C., N.F. & U.N.F., N.P.T & N.P.S., N.S., N.E.F. etc as per American National ISO metric threaded nuts Form Threads are available. Threads checked with 'go and 'not go' gages. BRASS NUTS to customer specifications can me made for bespoke usage to CAD drawings and prints.